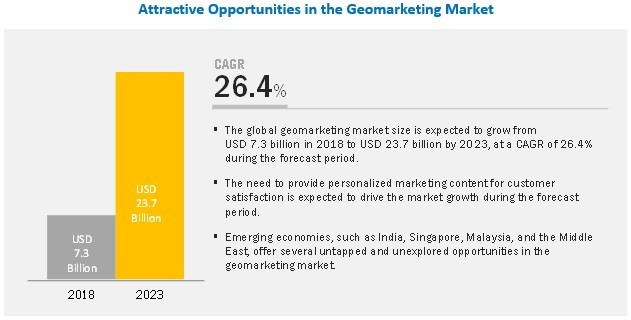 [168 Pages Report] The Geomarketing market is expected to grow from USD 7.3 billion in 2018 to USD 23.7 billion by 2023, at a CAGR of 26.4% during the forecast period. The factors contributing to the high growth rate are increasing demand for location-based intelligence to enhance the business outcome, use of location analytics and big data to collect comprehensive and differentiated information about potential markets and customers, wide acceptance of location-based applications among the consumers, and growing investment in digital marketing compared to conventional marketing. 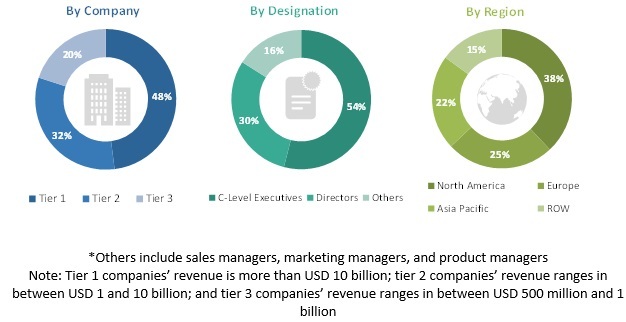 Among services, the deployment and integration segment is expected to hold the largest market size and is projected to grow at the highest CAGR during the forecast period. Deployment and integration services help in reducing the time required for deploying and integrating geomarketing solutions. These services ensure safety and security of integration of mobile devices with the geofenced ecosystem. Service providers safeguard and confirm the integration and installation of the geomarketing solutions for quality assurance. Retail business can use location-based promotional activities in multiple ways, such as sending proximity messages and using a geomarketing solution to the mobile devices of potential customers who pass by the store. Moreover, on the arrival of customers near stores, storekeepers can be notified so that goods ordered online by customers can be kept ready for pickup. Such kind of promotional activities help in reaching consumers at the right place and at the right time. Geomarketing campaigns help enhance the customer experience. Location analytics helps marketers find the most profitable customers and identify more such customers. North America to hold the largest market size in the Geomarketing market in the education sector. The US and Canada are the major contributors to the growth of the overall North American region. The growth in North America is mainly due to continuous technological advancements in the geomarketing field, increased industry standards regarding geomarketing, and enhanced financial support from governments. The region has many startups operating in the market. The 2 major contributors to the overall geomarketing market in the region are the US and Canada. Moreover, the companies in this region are focusing more on analytics strategies because nowadays customers are accessing multiple touch points. The major factors that are expected to hinder the market growth are the lack of standardized and uniform technologies and a shortage of resources and infrastructure in industries. Google (US), Microsoft (US), IBM (US), Cisco (US), Oracle (US), Adobe (US), Salesforce (US), ESRI (US), Software Ag (Germany), Ericsson (Sweden), Qualcomm (US), Xtremepush (Ireland), Plot Projects (Netherlands), Rover (Canada), Mobile Bridge (Netherlands), Hyper (US), Reveal Mobile (US), Galigeo (Europe), Navigine (US), Clevertap (US), Urban Airship (US), Bluedot Innovation (US), Merkle (US), Foursquare (US), and LocationGuru (India) are the key players in the geomarketing market. They offer various geomarketing solutions to cater to the demands and needs of the market. The major growth strategies adopted by these players are partnerships, collaborations and agreements, and new product launches or product enhancements. In September 2018, Adobe announced innovations powered by Adobe Sensei. The company offers AI and machine learning technology in Adobe Target and Adobe Experience Manager through Adobe Marketing Cloud to enhance the personalization of customer experience. In July 2018, ESRI announced the release of an indoor mapping product, ArcGIS Indoors, enabling interactive indoor mapping of corporate facilities, retail and commercial locations, airports, hospitals, and many others. In January 2017, Ericsson and Cisco extended their strategic partnership to include new Wi-Fi solutions named as Evolved Wi-Fi Networks (EWN). EWN combined Ericsson's 3GPP access, core networks, and applications with Cisco's Wi-Fi portfolio to provide reliable Wi-Fi. In August 2016, Qualcomm collaborated with Baidu for the implementation of the Qualcomm iZat integrated hardware location platform, which would be available in the latest generation of Qualcomm Snapdragon chipsets across all industry verticals. What are the opportunities in the Geomarketing market? How has the location-based marketing evolved from the tradition marketing practices? What are the dynamics of the Geomarketing market? The study involved 4 major activities in estimating the current market size of the geomarketing market. Exhaustive secondary research was done to collect information about the market. The next step was to validate these findings, assumptions, and sizing with industry experts across the value chain using primary research. Both top-down and bottom-up approaches were employed to estimate the overall market size. After that, the market breakup and data triangulation procedures were used to estimate the market size of the segments and subsegments of the geomarketing market. In the secondary research process, various secondary sources, such as Hoovers, Bloomberg BusinessWeek, and Dun & Bradstreet have been referred to identify and collect information for this study. These secondary sources include annual reports, press releases and investor presentations of companies, whitepapers, certified publications, and articles by recognized authors, gold standard and silver standard websites, regulatory bodies, trade directories, and databases. 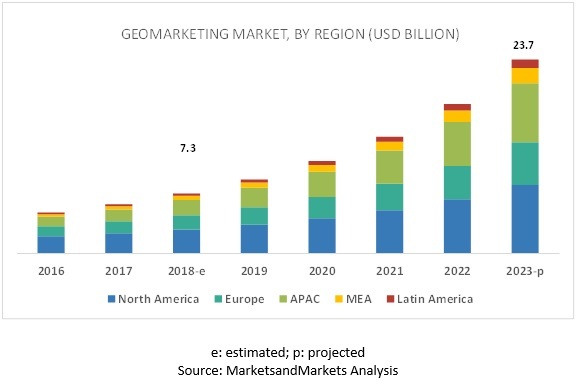 The top-down and bottom-up approaches were used to estimate and validate the size of the global geomarketing market and various other dependent submarkets in the overall market. While using the top-down approach, an exhaustive list of all the vendors who offer solutions and services in the geomarketing market was prepared. The market share of all the vendors in the market was estimated through annual reports, press releases, funding, investor presentations, paid databases, and primary interviews. Each vendor was evaluated based on its solutions by technology, product type, and application. The aggregate of all companies’ revenue was extrapolated to reach the overall market size. Furthermore, each subsegment was studied and analyzed for its global market size and regional penetration. The markets were triangulated through both primary and secondary research. The primary procedure included extensive interviews for key insights from the industry leaders, such as Chief Executive Officers (CEOs), Vice Presidents (VPs), directors, and marketing executives. After arriving at the overall market size using the market size estimation process as explained above, the market was split into several segments and subsegments. To complete the overall market engineering process and arrive at the exact statistics of each market segment and subsegment, the data triangulation and market breakdown procedures were employed, wherever applicable. The data was triangulated by studying various factors and trends from both the demand and supply sides.